Danny interviewed Jeremy Feasel (@Muffinus – senior game designer II) from the World of Warcraft Team to discuss questions concerning the new expansion: Battle for Azeroth. Danny asked some of the questions we have gathered from the Discord, Reddit and WoW community and some by our staff. Follow us on Twitter @blizzplanetcom for updates: BlizzCon panel transcripts and interviews. Note: Handclaw played the Battle for Azeroth demo and noticed a new Baine model in the End Time Dungeon Journal. **Some answers in this interview that ask about the story of people or zones, are heavy in SPOILERS. Read at your own discretion. I’m Danny (with Blizzplanet) and I’m here to interview Jeremy Feasel on the World of Warcraft team. So Jeremy, why don’t you tell me a little bit about what you do in the WoW Team and How is your BlizzCon so far? Jeremy: BlizzCon is always great. We get super energized by the fans. Being here is kinda like time to recharge my energy packs for the year. I have worked really heavily in this expansion: the Islands feature, the World Quests (in the last expansion as well), and as always… pet battles. Danny: Why don’t you elaborate a little bit on the Island features. I saw a little bit of it in the panel yesterday. It would be cool if you can talk about that for a minute. Jeremy: Islands is really our opportunity to play around with the idea of coming to a different land every time you land there, where we have put a whole lot of energy into the technology that allows us to at that top end before you land on the island to tell a story. Trolls[?] live here. You might show up in an island with primitive huts, and we have a whole lot of creatures that can show up at primitive huts, and various different configurations. They have a bunch of different poses that can show up in different configurations, different groupings, different difficulties, different amounts of Azerite, or different consumables that you are fighting over; and really it gets to the heart of old-school rogue-like, where as you are making your way through the space, you have a puzzle in front of you. Do you take over the capture point at the top of the hill (that gives you access to a couple of powerful cannons that give you an extra button that allows your cannon to fire things if you make your way across the rest of the island, and then when you see that the next time, it is probably in a different spot; but you know what it does, and you know how it can help you in the rest of the space; and that will change up how you strategically play your way through that island; and the important thing is here that it doesn’t use our traditional spawning — where you usually see the same creature in the same location. In fact, we sorta mark up the world with how it exists: this is a sea-faring location, this is a primitive hut location, and then just about anything can show up there; and that means that we don’t even know what kind of experience you will have. Of course, we have got tools that can tune that. So it is not going to be a bad one. But it means that playing your way through the space always feels a little bit different, and you are not quite sure what’s going to be in that cave the next time you go in there. Danny: Can you talk a little bit about the leveling flow? Three levels per zone, how is that going to work. There are actually 10 levels. 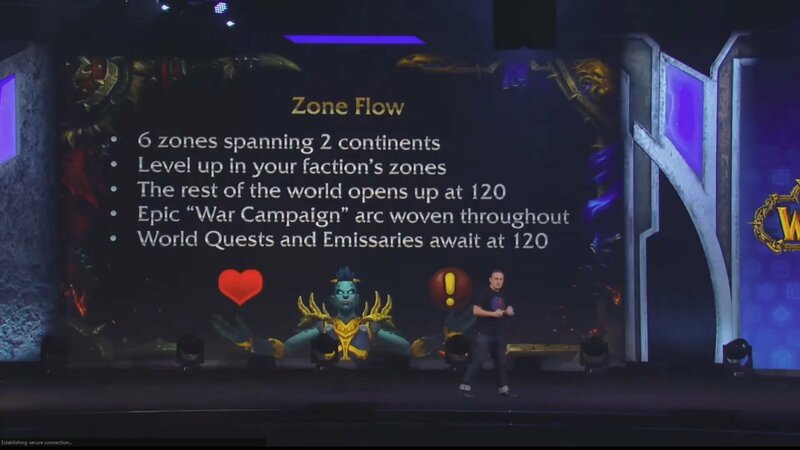 Jeremy: So we have three zones for each of the factions, and the leveling will be split by those three zones. During the course of your leveling, you will also be starting the War campaign which is a meta storyline that kinda over-arches the whole expansion pack. That includes: you heading to the continent, and starting to explore there, you will go to your first island. It is our opportunity to play into the Alliance vs Horde elements, and for you to start building up things for your particular faction. Similar to Legion, you will have the interstitial major story quest beads that will be showing in between the individual zones, as you level and as you spread across those zones. In Legion, we had the Pillars of Creation, which is kinda like the overall thing to unlock Tomb of Sargeras. So is there some kind of similar overall hook throughout the questing experience in Battle for Azeroth? Jeremy: It kinda gets into a little bit of that meta questing-line. You saw a similar thing with Illidan’s questline, that it went throughout the course of the entire expansion; and it carries with it certain story elements that integrated themselves getting there. It may seem the same thing for a lot of our major characters in Battle for Azeroth. 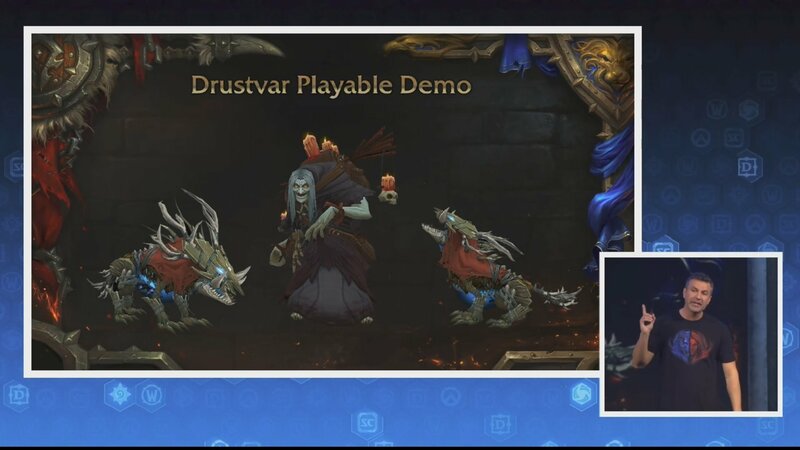 You are going to be seeing the next development in Anduin, Jaina, Sylvanas, and Thrall, and even Vol’jin; and how their stories are playing out on both of the continents. So it is really going to give you that feeling of building them up as characters, as told in the next part of the story: the faction war, as you progress throughout all the different zones of this expansion. Danny: So you briefly mentioned Illidan. We heard that you are not done with Illidan. Is that really wrapping up in Legion, or can we expect some Illidan in Battle for Azeroth? Jeremy: I am not going to give you any spoilers here, but the end of the battle for Antorus, which is still to come for players, and especially the Finale Cinematic that you are going to see at the end of that, is absolutely bonkers. It is going to answer all your questions. It is going to bring up a whole lot of more questions, I hope. I can’t wait to see that in your hands, and I am not going to spoil it for you. So they mentioned the Burning of Teldrassil, and the Assault on Undercity. 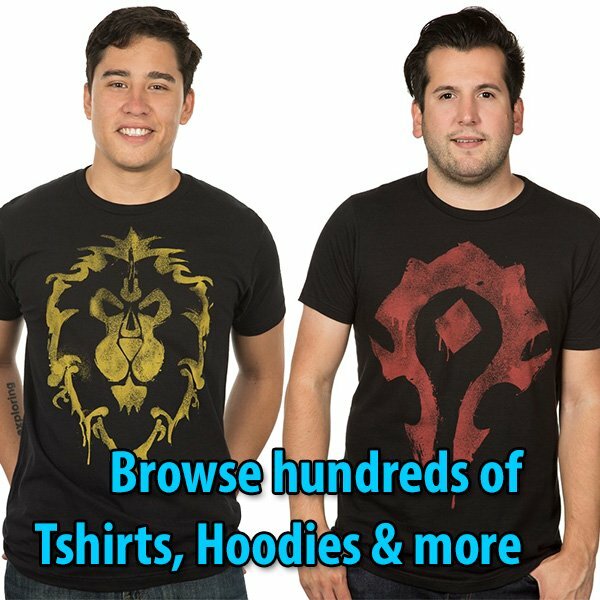 Even a potential Horde-only Kalimdor and Alliance-only Eastern Kingdoms. So what does that kinda mean for the existing Night Elf and the Undead cities? Anything you can talk about that? Jeremy: Similar to the story, looking of other quests that you see in World of Warcraft, you can still level up in the initial Night Elf starting zone: Teldrassil. Same with the Horde starting in Tirisfal Glades: the Undercity. Once you get to that point in the story, that is when the story changes. Once you hit max level, you go through the story experience, then the world is forever changed for you. So your answer is that new phase version of the world where Teldrassil is on fire, and the Undercity is taken by the Horde (EDIT: Not sure if he meant Alliance); and then where we go from there, you will have to see in the expansion. Danny: The Blood Trolls of Nazmir kinda have a Hakkar-vibe to them. Is there any relation? Otherwise, what Loa do they serve? Jeremy: Ohh, that is a very good question. Have you played the experience on the showfloor? So not to spoil a huge amount for you, Bwonsamdi (the Loa of death) plays a major role in that zone, and you will meet him for the first time, and see what he is all about; but really, these Blood Trolls are under the servitude of a powerful new creature that you will meet in the very first raid of this expansion. So there is a facility in Nazmir, where the Titans were doing experiments on Old gods. They were trying to solve the Old god problem; and you can imagine when you start experimenting on an Old god, really bad stuff has the potential to happen. What they ended up creating was something far worse; and this sorta new blood god — who you are going to see eventually (and this a huge amount of spoiler for you), but this facility only has one of the three seals remaining on it. During the course of the expansion, you are going to find out what happens to that last seal. What are the dark forces invading Stormsong Valley, and what’s going on there? 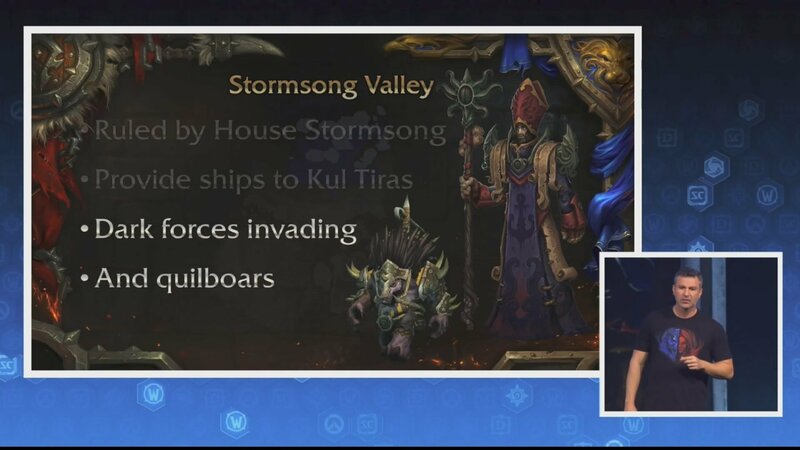 Jeremy: We are quite not ready to go super deep into the story of Stormsong Valley. What I can tell you is that they have a long have had this history of the sea priests, that you saw yesterday, who bless the ships that head out to sea; and they have a special kind of sea priest magic that is really in tune with the waves, and in fighting by using wave power, and stuff like that. It is not quitely elemental-shamanic, it’s more of a sea blessing sort of side of things. And then it is in that group that you find out that there are some insidious curse that is taking over from within, and creating even worst creatures — that I am not going to tell you what they are. That you will find out. Danny: The Drustvar video showed witches and spirit golems. Who are these enemies, and do they serve the Void? Jeremy: The Drustvar witches — a super really interesting story with this guys, in which you go into during the Drustvar experience — long time ago, there was a group called the Drust people. They lived in Drustvar, and when that area was overtaken by humans, they slew the Drust, and the Drust were large hardy kinda people; but the Drust didn’t leave. They exist as spirits that live in the area, in the dead realm; and have been slowly trying to work their way back into our world. They have made a pact with the leader of that settlement: Lady Waycrest, and ultimately, because of all the political intrigue going on between the 4 different Houses in Kul’Tiras, she decided to accept their help in exchange of the ability to have a stronger seat on that council — more political power; and as you can imagine, if you accept the help of some spirits that are just for vengeance against your people, very bad stuff happens. So not going too much into detail about that, but it really gets into that vibe of creepy witches, these macabre figurines they infuse with the souls of others to act as their minions; and one of the things that you saw onscreen yesterday, was this creepy-looking banshee creature. So (9:14) witches get up to the point where they are ready to ascend, they accept the dead realms’s advice and slit their own throats, and become an ultra-powerful witch that have completely lost their minds. Danny: So do they serve the void, or anything? Jeremy: You will have to find out. Danny: Can you talk a little bit about Warfronts, and what kind of rewards we can expect from Warfronts? Jeremy: Both Warfronts islands really — in regards to rewards scheme, we aren’t quite ready to completely nail down anything yet; but what we can tell you is that we have learned a huge amount from the different systems that we have put into Legion: world quests, Mythic+, raids and dungeons, and PvP. All felt like they had their place in the rewards scheme in the end-game. We will make sure that we have different axis of rewards for each of these things, so that you will continue playing a wide variety of different content in the end-game. You won’t feel like you have been locked out of a particular content. We feel like Isles and Warfronts both fit within that scheme of things, and we want you to continue playing throughout the entire year of the expansion pack, and will have cool and unique rewards associated with them; but also evergreen rewards schemes. Like for example, Islands are one of your greatest sources of Azerite. Something that we want you to continue to do every time islands are out kinda-thing. It is something that we want you to continue to do during the course of the expansion pack. Danny: Are there any plans for battlegrounds or arenas set in Stormwind and Orgrimmar? Jeremy: Not currently. We have two Arenas that are centered around the two new continents, and then of course the new Silithus-based battleground. Danny: Back on the Warfronts: You guys announced Stromgarde. It is not the only Warfront out there. Right? Is there going to be more? I think there was some confusion on that. Jeremy: Currently, Stromgarde is the Warfront that we are working on. Finalizing for this particular expansion pack. We don’t have much else to say beyond that other than we are working very hard at making it an awesome experience. Can’t wait to get it in people’s hands to see how they feel about it. We feel the same way. It is like an awesome system to build on. One of the things we are focusing on with this particular Warfront is making sure that every time that you come into the Warfront, that it feels like a little bit different experience. You are facing off against different enemy commanders that have different troops that they will send out against you, they will take different attack tree paths in their own base. So you will be facing against different stuff; and also during the middle of the Warfronts, various events happen. In one Warfront you might have a goblin vendor show up that is willing to sell the boat sights (11:54). They will give you a couple of powerful consumables to use in that Warfront. On another Warfront you might go in, and Jaina shows up all of a sudden and says: “Everybody to me!” and all 20-players are now joining Jaina to take over a particular point in that Warfront before she has to take off for her next meeting. So we are going to have all these different crazy cool things that you will feel like you are awesome for being a part of this faction, you know, use all those faction heroes that are building up in this expansion. Danny: So the plan is just this one for this expansion, and then see how it works out, if we go further, or I guess it is unknown at this point. Jeremy: At this point, we will see. Danny: With the introduction of the 6 Allied Races, are more coming? Are we going to get increase the amount of characters per server? Jeremy: Yes. We will be increasing the Character Slots. We are not quitely ready to let you know what that number is yet, but we recognize that you don’t want to delete your characters in order to make all these new Allied Races. That’s for sure. The system, now that we have it in place, is very expandable. We do plan to have an additional Allied Races in the future. We would absolutely love to hear from players what they would most like to play as. We have been hearing a lot of this from players for years. We are super happy to get this feature into their hands. I know everybody has got a different opinion about what they want to play as. Please, tell us what you like. We want to hear about what you are super jazzed about. Danny: Do you think we will see more within this expansion? Or would that be more of a “in future expansions” at this point? Jeremy: We will see, at this point. Danny: What kind of customization would players expect with these 6 Allied Races? Jeremy: Each of them is being both from the ground up designed to have their own customization options, in some cases that means Lightforged tattoos that look really different, I feel the Dark Iron dwarves they have their own beards and hairstyles that have flecked embers that are flying off them, like that is all zeroing in all-out to me, it feels like these guys are perfectly customizable for each other. The real realization that (13:48). You are a Dark Iron dwarf fray, and you want to feel like it. Danny: If you play Alliance, obviously you have to do the quest to unlock the Alliance Allied Races, but do you have to do the same thing on the Horde side, or do you unlock both, or how does the unlocking of Allied Races work? Jeremy: It is intrinsically tied to the story of that particular faction. So it makes sense to unlock only that particular faction for each side; however, there is two additional things to do along. First, when you unlock an Allied Race, it unlocks for your entire account; and if you transfer that character it would be unlocked for that new account as well. So you only have to unlock it one time, and then you can character transfer it, or you can faction-change (14:40) you won’t get the Heritage armor set for doing that, if you are level 20+ (14:44); but also works really well with changes to the scaling world. So we think it is a lot more fun to level up now that you can complete the story of each zone before moving on to the next one. On the same lines, though, we did want to know because a lot of these factions are factions that exist in the game already, like Highmountain taurens, Lightforged draenei… you can already begin working towards unlocking those factions. So the faction unlock requirements haven’t been 100% nailed down; but we will of course include things like finishing up the story of the Highmountain questline, and getting some amount of reputation with them. So you can assume those are pre-requisites you can start working on them right now. Danny: With Allied Races and the customizations that we are seeing, do you guys have any plans for more transmogs sets worn by NPCs, Heroes like Rhonin, any thoughts of having transmog sets unlockable that aren’t necessarily standard rewards? Jeremy: That’s an interesting question. We are always looking for new sources of transmogs, actually we have made a new major system that we put in pretty recently, we want to hear what players like about this system, what they would like to see more of. Couple of examples that have come out relatively recently, were our change to have a Holiday-specific transmogs so that you can wear your christmas hat, all throughout christmas holidays (Winter Veil, rather), Hallow’s End witch hats are another example of that. It is a cool way to play around with the transmog system. Heritage armor sets also, we’ll get to that. Once you unlock a Heritage armor set, it is useable by any different armor wearer, because it is a cosmetic armor. You can transmog it over a plate, as well as cloth (16:35). We want to continue doing some stuff like that. We would love to hear more things that the community want now that we have the new system in place, we can always do more stuff with it. It’s all I (16:43) time, really. Danny: Does the Heart of Azeroth necklace borrow any ideas or tech from the Artifact system, and can you tell us a little bit more about the Heart of Azeroth, and its purpose? Jeremy: For sure. So we wanted to solve some of what we perceived as some of the problems with the Artifact system. There is a lot we really liked about it, and now there is a lot that we want it to evolve. One of the things that we wanted to evolve was having “spec-specific” artifacts… feels like you had to choose between level your tank or your healer. Here the Heart of Azeroth is a one individual item, you don’t have to make that choice anymore. You just level up as a character. If you need to go heal a dungeon, you will continue earning Azerite that helps you tank later in your raid. We felt like this is an awesome direction to go with this thing. In the seamlines, one of the things that we thought was awesome about the Artifacts is that it felt like you were making meaningful choices during the leveling experience, and even during end-game. You were continuing to add points into the Artifact well beyond hitting max level. However, you hit a certain point where you were done, and you started putting points into this one Concordance trait (whatever it was during the course of the three different patches that it was changed); and we felt like that lost a lot of that goodness of making a lot of cool player choices; and having your gameplay change during the course of that experience; and it kinda locked in how your character plays for the rest of the expansion. But what if we didn’t have to do that? What if you continued giving us some choices to make all the time? So that is one of the major purposes of Azerite armor is that when you are doing your normal raid, and then your heroic raid in this week — because your guild is good — and you pick up a new helmet, and that helmet might have completely traits and abilities to choose from; and you get to have that moment of making all those choices again; and in some cases you may choose to go with something a little bit different than the thing you did last time; because of how these different items synergize together. This is also a cool opportunity for us to give you rather than one artifact and one set of traits, imagine 3 different things, and then every once in a while they will have interesting synergies between them that will incentivize you to go down specific directions. An example of it, and now I am just completely pulling this out of thin hair, is imagine you have got a Shoulder piece that gives you additional crit on Lightning Bolt, and then you get a Helm that one of the three traits you can pick has a chance that when you crit with Lightning Bolt, to shoot another extra Lightning Bolt that has extra damage; and that would make you think twice about how to synergize a thing or two; but then if you get a different Shoulder, you might change your Helm decision, or pick out a new Helm that has– you know. So you are constantly making choices even throughout the end-game, which is really good. Danny: With the way the scenarios are, and kinda how the randomization of those — do you think that we might be able to see some of that in the future with dungeons, and would you guys like to do something like that? You know… more randomization procedural dungeon-type stuff. Jeremy: This is our first foray into procedurally-generated spaces, and an adventure that crafts itself right as soon as you pop into the area. I feel like we are going to learn a huge amount from this. We have put a lot of effort into the tech of… both: that, and this brand-new Advanced NPCs, which also have the opportunity to be both really awesome and predictable elements; and then we can also tune them up to the point where they are super rude to play against, because they — you know: polymorphs your healer, and they Sap you, and then they jump to the other character right when he is low health, and stuff like that. There is a huge amount of tuning ups that we have, and that is one of the reasons that we are doing 4 different difficulties, because we realize that is like a mythic level sneaky-peek right there. [laughs] So the technology is massively expandable; and we have built it with the idea of being massively expandable. To me at this point, working on this particular technology over a year now, I feel like the sky is the limit with where we can take it. We will see how Islands go. We hope everybody likes that particular feature.